Stainless steel reusable precision trochar with regular medical point needle and rounded stylet protruding 1/8" from needle point for easy implantation of small pellets up to 3mm in diameter (usually 0.001 mg to to 5 mg pellet). Note: A physical restriction on the pellet could alter the release rate. An injury to the muscle will cause local inflammation. The most ideal place to implant the pellet is where there is maximal space between the skin and the muscle such as the lateral side of the neck between the ear and the shoulder. 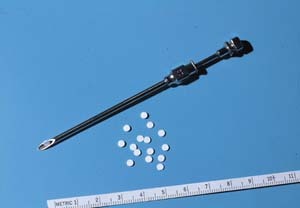 Put pellet in a standing position on needle of trochar, away from sharp edge and press gently. Pellet should be stable in that position so that if trochar is pointed downward pellet will not fall. Put obturator half way in trochar and hold with stronger hand. With other hand lift skin on the lateral side of the neck of the animal and insert trochar. When the pellet in the trochar contacts the skin, twist the trochar sideways and insert pellet. Then, push with obturator all the way. Total distance from incision is about 2 cm. Lift the skin on the lateral side of the neck of the animal. Make an incision equal in diameter to that of the pellet. 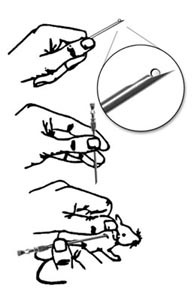 Make a pocket horizontally with a pair of forceps about 2 cm beyond the incision site. Put the pellet into the pocket with forceps.